After another successful year the Australian golf industry is ready to celebrate on Tuesday night, 28 November, at the Greg Norman Medal. 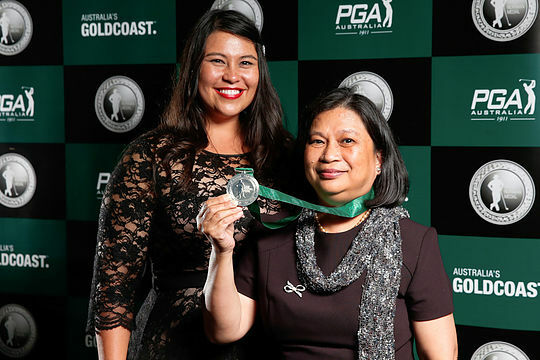 To be held at RACV Royal Pines Resort on the Gold Coast, the Greg Norman Medal is an opportunity to celebrate the individuals who collectively make the Australian golf industry a success. The pinnacle award of the evening is the Greg Norman Medal which is presented to the male or female golfer who has performed best on the world’s biggest stages. The 2017 nominees include Katherine Kirk who won on the LPGA, Minjee Lee who was incredibly consistent recording eight top-10 results on the LPGA, Jason Day Australia’s highest ranked player, Cameron Smith who recorded his first victory on the PGA TOUR and Marc Leishman who won twice this season. “The quality of our golfing talent is incredibly deep as displayed by the talented individuals nominated for the Greg Norman Medal this year,” said Gavin Kirkman, CEO of the PGA of Australia. Speaking ahead of the Emirates Australian Open, Day commented on how special it was to have won Australia’s most prestigious individual honour; the Greg Norman Medal in 2015 and 2016. “To win it the first time was special because as time goes on, people will look back and wonder 100 years from now who the first person was and I was it,” said Day. “He was the Number 1 for 331 weeks, through talking to Greg I have gained a lot of motivation about what 331 weeks means and the level of hard work you have to put into the game, not only to get there but to also stay there,” added Day. However the selection of this year’s nominees was a tough prospect, in addition to the five players chosen, Brett Rumford and Jason Norris recorded victories on the European Tour, Todd Sinnott won the Asian Tour and Japan Tour co-sanctioned Myanmar Open and Hannah Greenn had an incredible rookie season winning three times on the secondary Symetra Tour. The Greg Norman Medal committee responsible for selecting the recipient each year consists of Greg Norman, Chairman of the ALPG Shani Waugh, Chairman of the PGA of Australia Peter O’Malley, PGA of Australia Board Member Michael Long and PGA of Australia Life Members Bob Shearer and Ian Baker-Finch. The other highlight of the evening will be the induction of two PGA Professionals as Immortals of the PGA of Australia. These two individuals, to be announced on the night, have made a significant impact on the game over the past 60 years. They have changed lives, sculpted swings and passionately promoted our game.